“We used Kyber to coordinate a major product launch. “Our sales department relies on Kyber to assign and follow up on client requests. “Kyber is great because it has so many functions, and they just work. “Kyber has dramatically increased our team productivity by keeping us all on the same page. “We are going with you guys over Asana after checking both out. Get a complete suite of powerful apps to help your team work better and faster in Slack: Task and project management, automated standup meetings, instant polls, team surveys, message scheduling, meeting planning, personal to-do list and with templates you can customize and configure your own micro-apps. Kyber is ideal to coordinate work between your marketing, product management, sales and engineering teams or to run more efficiently individual teams. All inside Slack, all via Kyber. 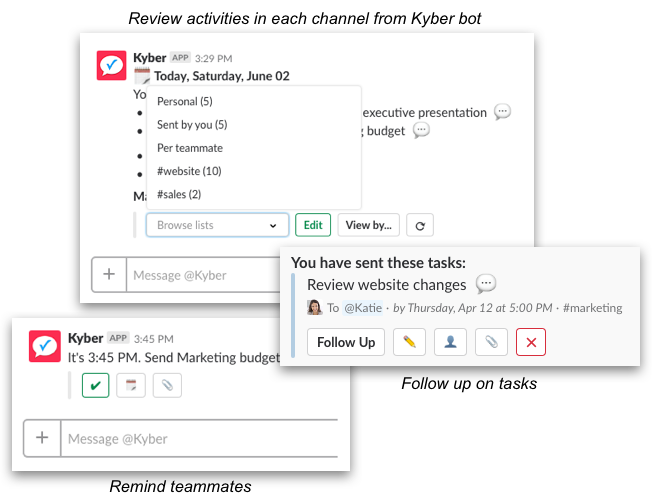 Stop switching between Slack and unnecessarily complex, external apps: get more work done in Slack, by adding simple to use, fully integrated, intelligent Kyber apps. Instantly provision Kyber to your entire team without creating new accounts, consolidate multiple apps into one, save time and (a lot) of money. Track and manage daily tasks or entire projects within any Slack channel: save time, never drop a ball, get more done. 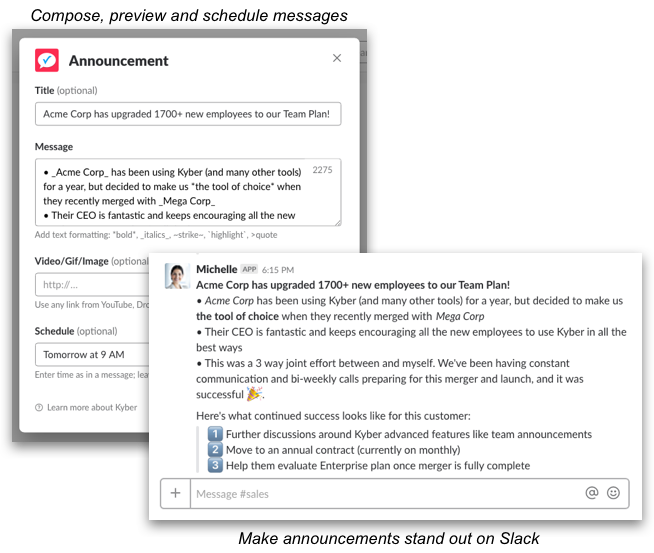 Turn a new or existing Slack message into a task, set a deadline, assign it to a teammate, add comments or attach documents and files. All without leaving Slack. Each channel member can access the shared project list: when an item is completed, the channel is notified to share progress, reduce micromanagement and motivate your team. Leverage the intelligence of Kyber bot to effectively manage your team. 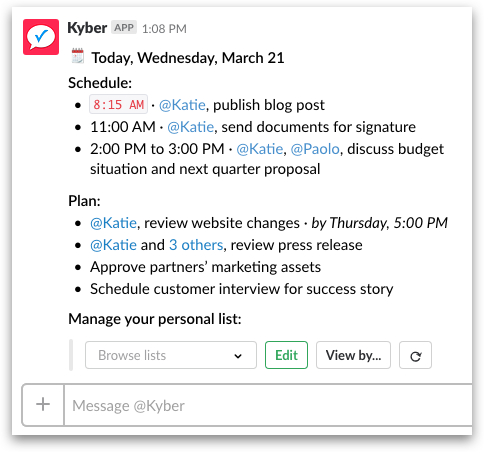 Add deadlines or reminders to task and have Kyber bot remind the right people or entire channels. Review and balance the workload between each employee across all Slack channels from a single place. Follow up on assigned tasks and receive a status update with completion percentage. Finally, browse each channel from Kyber bot to have a complete pulse of what important is happening on Slack. Get immediate feedback and drive consensus with team polls. 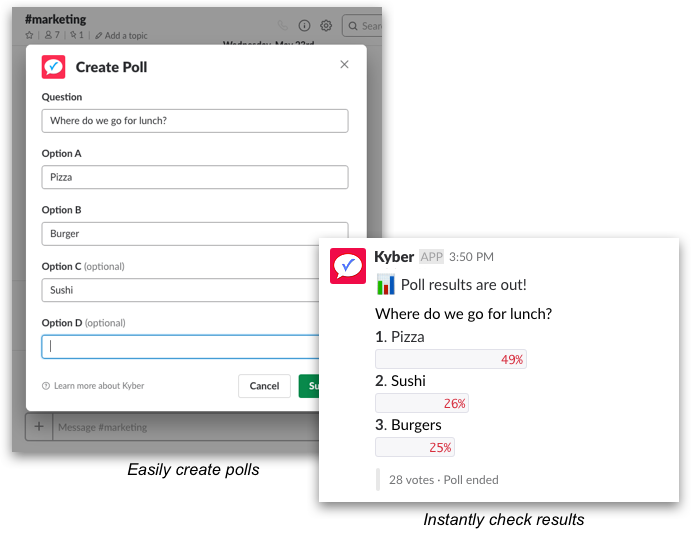 Turn a question on Slack into a poll or start a brand new one; add poll options, let your team vote and review results in real time. Ideal to make fast decisions, from strategic ones (“What discount should we offer?”) to logistical ones (“What sodas should we order?”) or to periodically check on team morale and to gather feedback on company activities. Compose your messages or team announcements when it’s convenient to you, preview them and finally pick a time to schedule them. Too late at night to send that message? Is your team in another time zone? Schedule your messages to be delivered, as sent by you, at any later time. Make your important message stand out on Slack by adding a title, bullet lists, advanced formatting, images, gifs or videos. You can also setup recurring messages to build team habits and automate common activities. Kyber Calendar is the first native calendar for Slack, that can be exported and viewed on Microsoft Outlook, Apple or Google Calendar apps. 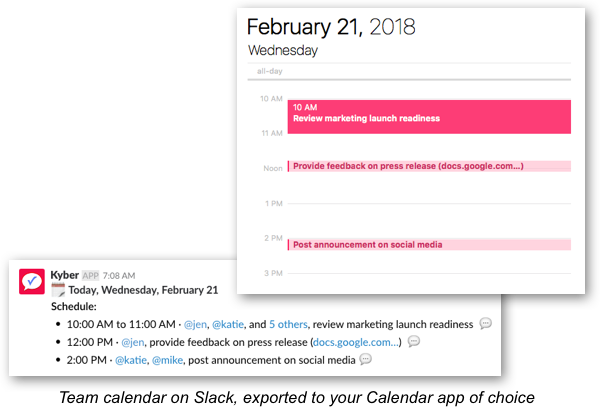 Create shared team calendars per each Slack channel to track meetings, deadlines and reminders. Use the personal one to plan your day and stay on top of it. Schedule, accept or decline meetings with interactive messages on Slack. Invite individual team members or entire channels, add meeting agenda or action items. 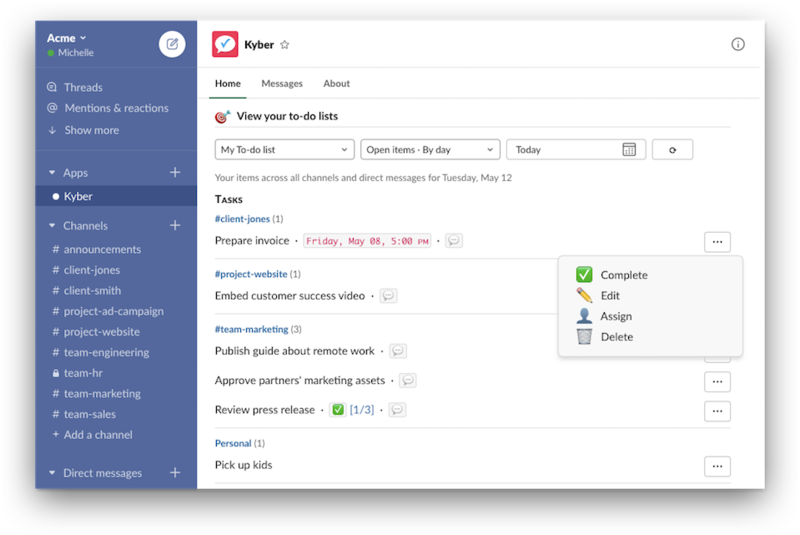 Kyber brings in a single place all your to-dos, reminders, polls, announcements and meetings – not only your personal ones, but also those received from teammates, and those imported from apps like Gmail, Outlook, Github, etc. With its artificial intelligence, Kyber creates a short, actionable plan for your day to let you know what to do next: you will be able to focus on what’s important and get more done. Through advanced Natural Language Processing, creating complex tasks becomes as easy as entering a normal message. And it works with Apple Siri and Amazon Alexa too! Visit the Kyber channel on IFTTT.